Many educational groups are concerned about how best to meet the particular needs of students with diverse sexual orientations and gender identities. District and school leaders plan for educational opportunities and teacher education that respond to the learning needs of all their students. However, not all schools and districts have leaders and teachers with backgrounds in gifted and talented education who also know how to best address the particular needs of gifted students who are gay, lesbian, bisexual, transgender, and/or questioning (gifted LGBTQ). This resource is designed to be shared with superintendents, principals, other administrative personnel, teachers, counselors, and parents. These documents are intended to be downloaded and shared. NAGC believes in supporting the success of all gifted students. Factors such as race, gender, ethnicity, level of English proficiency, socioeconomic backgrounds, sexual orientation, and gender identity should not become barriers to opportunities for gifted students. 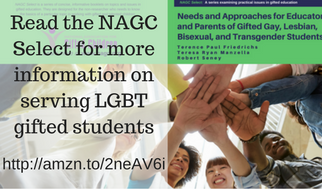 The purpose of this resource in the Toolbox is to supply information specific to enabling gifted LGBTQ to participate and thrive in school. NAGC recommends that educators demonstrate compassionate understanding of these students and support them in maximizing their potential. Changing the historical trend of discrimination against Gifted LGBTQ students and the lack of role models in their curriculum and educational resources requires a commitment to long-term, systematic evaluation of curriculum and program improvement. Unlike most other groups of gifted students, they may be placed in social-emotional double jeopardy (Keener, 2013; NAGC, 2015; Sedillo, 2013; Treat, 2008, 2016). They may not only feel different from other youth because of their advanced academic ability and/or talent, but may also feel isolated due to their sexual orientation and/or gender expression (Cross, 2013; NAGC, 2015; Sedillo, 2013; Treat, 2008, 2016; Whittenburg & Treat, 2009). Interventions are necessary to support the unique psychosocial needs of gifted LGBTQ students (Friedrichs, 2012; Peterson & Rischar, 2000; Treat, 2016; Whittenburg & Treat, 2009), and administrators, teachers, and counselors require specific, ongoing professional development to understand the needs of gifted LGBTQ students (NAGC, 2015; Sedillo, 2013; Whittenburg & Treat, 2009). While many believe that gifted LGBTQ students are a small minority of the overall school population, according to an emerging body of research (Friedrichs, 1997; Treat, 2008), the population of gay, lesbian, and bisexual students may be much higher than previously realized. Still no matter the size of the population, all gifted children are worthy of understanding and support. The following statistical information, legislation, and court cases will be useful in understanding why the suggested changes are needed in curriculum, instructional strategies, planning, and professional development. 98.1% of LGBTQ students heard “gay” used in a negative way (e.g., “That’s so gay”) at school; 67.4% heard these remarks frequently or often, and 93.4% reported that they felt distressed because of this language. 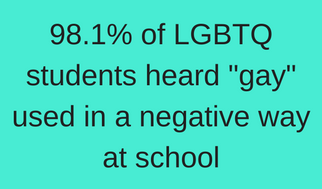 These statistics inform educators and parents about the experiences of LGBTQ students in school. When giftedness is compounded with gender/sexual minority status, the students are, in the view of classmates, teachers, and administrators, twice other. This dual status can make these youth more vulnerable to verbal and physical abuse at school than either giftedness or gender/sexual minority status would on its own (Manzella, 2012).